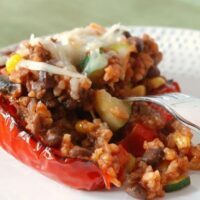 These Southwestern Stuffed Peppers Without Rice are packed with beef, sausage, corn, black beans, zucchini, and rice cauliflower. Consequently, you’ll feel good about eating them, your tastebuds will be ecstatic, and your tummy will be satisfied. Grain-free if you care about such things. Do you have the hours of operation posted in your kitchen? Although I don’t have a sign, they are imprinted in my mind. Of course, seriously hungry people and grandchildren are welcome 24 hours a day, but meal preparation isn’t usually happening after 7 pm. It helps me avoid the dangerous evening snack habit. For this reason, when my husband comes home late from work or Bible study and the kitchen is unofficially “closed,” I frequently go to my freezer. 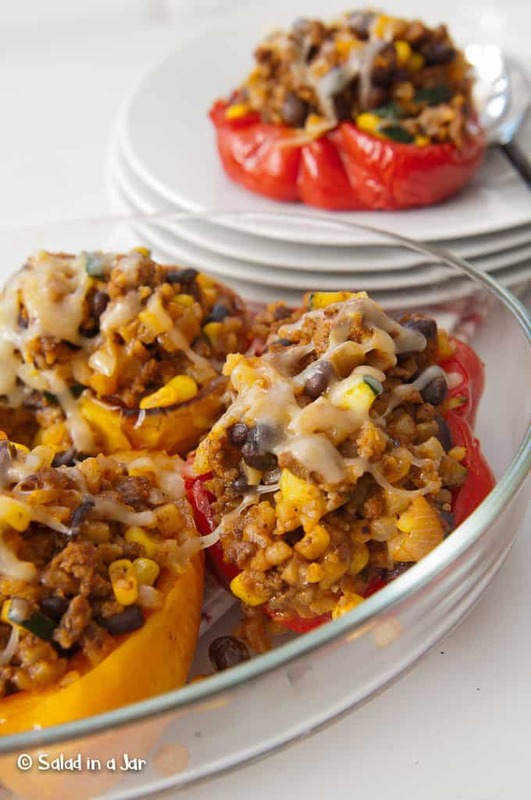 A frozen stuffed pepper will microwave from rock hard to fragrant and steamy within minutes. Eat straightaway for a healthy and satisfying meal. 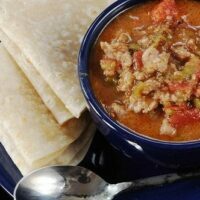 An equally delicious option is slicing them up to make a filling for a flour tortilla. It’s a veggie burrito of sorts. Broiling the peppers in the oven only takes a few minutes. Peeling not required. 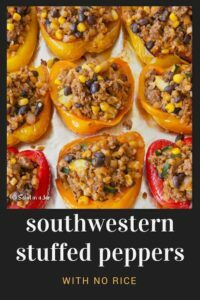 You can use green peppers or the sweeter and milder red, yellow, and/or orange bell peppers. No zucchini in the crisper? 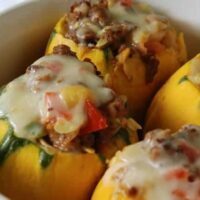 Use yellow squash–or leave it out. No black beans? 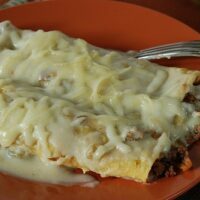 Use pinto or ranch-style beans. In the same way, leave out the corn or onions if you prefer. In summary, this is a good clean-out-the-fridge/pantry recipe. 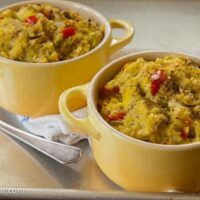 Despite the deliciousness of using cauliflower instead of rice, if you prefer to use rice, see my original recipe here. 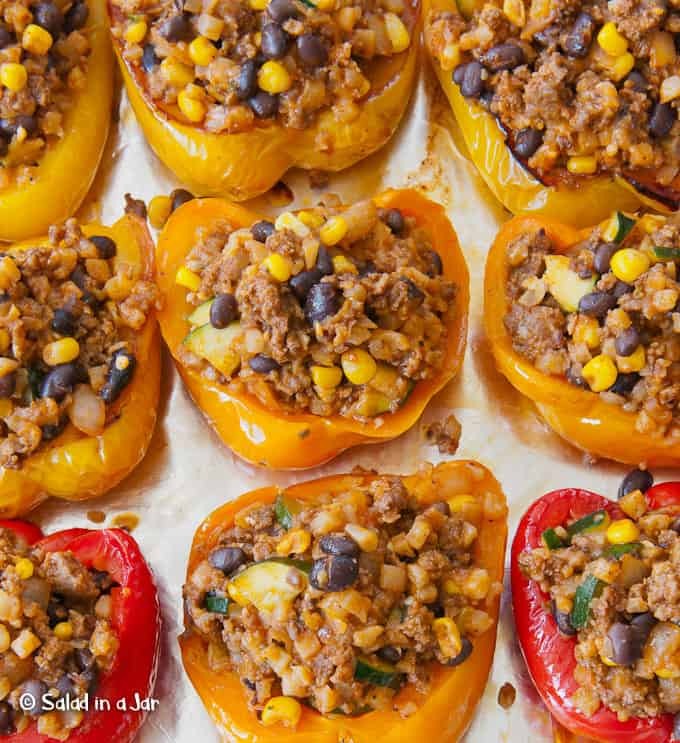 Bell peppers of many colors are filled with a Southwestern-style filling. 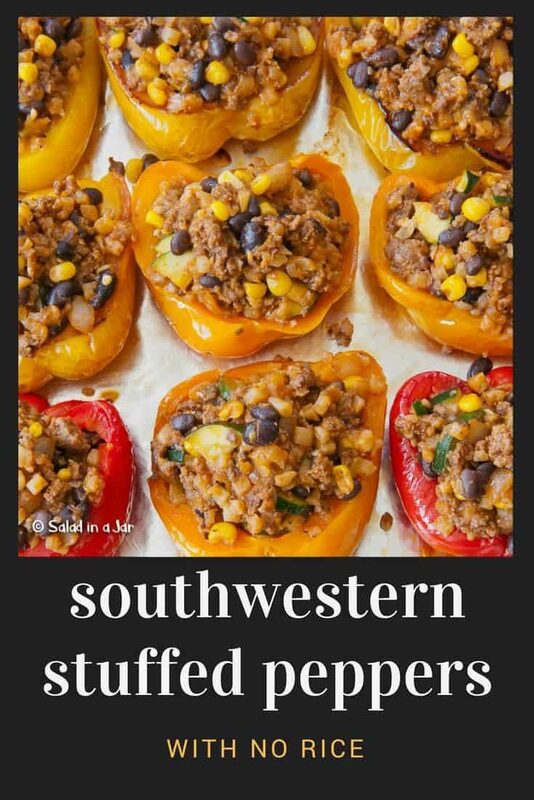 Works great to make ahead and freeze. Heat oven to 450 degrees. Line a large jelly-roll pan with foil. Spray outside of pepper halves with oil. 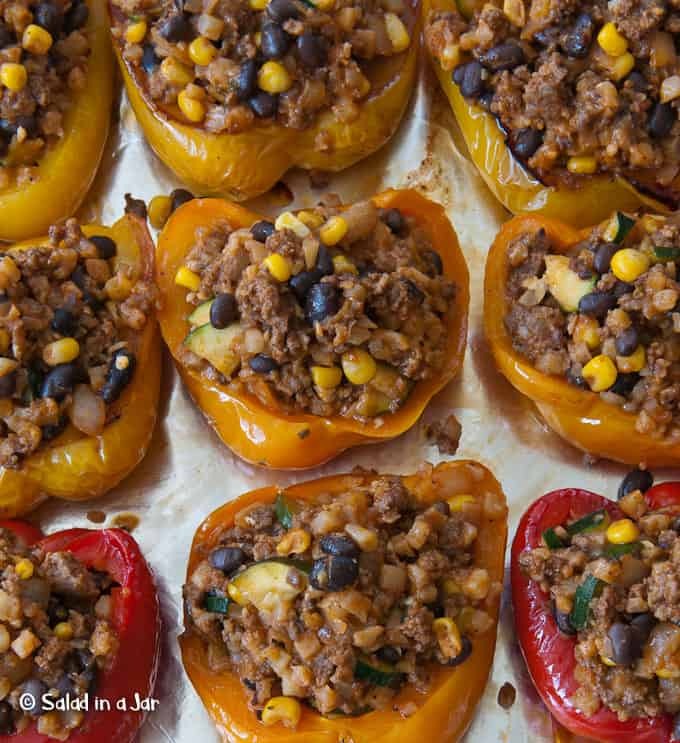 Arrange peppers cut side down on prepared pan; bake on lower rack 15 to 20 minutes. When finished cooking and tender with a few random dark spots, turn right side up and arrange in 9 x 13 inch casserole dish. Turn oven back to 350 degrees. 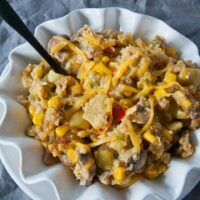 Cook cauliflower rice if not already done and set aside. Meanwhile, sauté ground meat in a large skillet. Add a little salt and pepper while cooking. Drain excess grease. Add onions and garlic. Sauté for 3 minutes until soft. Add cooked cauliflower rice, zucchini, corn, black beans, tomato sauce, spices, and heat thoroughly. Spoon hot veggie mixture into cooked pepper halves. Sprinkle cheese over the top. Cook in 350 degree oven until heated through and cheese is slightly browned, 10-15 minutes. Freezes well. If you have not purchased cauliflower already riced, you can make cauliflower rice from fresh cauliflower. See instructions here. Cauliflower will reduce drastically, possibly more than half, when you steam or sauté it. Don't worry about getting exactly 2 cups of cooked cauliflower. A little more or less is not a big deal. This was absolutely delicious! I used red bell peppers and roasted them only 10 minutes to just get them softened up a tad. My meat mixture looked a bit on the dry side, so I added a can of fire roasted diced organic tomatoes just before filling the shells and I know I used a ton of cheese, because in this household there is no such thing as too much cheese in toppings. Husband is diabetic and rice spikes his sugar badly. He also hates cauliflower. He not only happily ate this, but announced it was a definite keeper! So thank you, thank you, thank you! Personally, I think I will stay with the sweeter red and maybe yellow peppers. The complexity of taste and flavors was really nice. Thanks for coming back to report on the results, Glory. Love that you customized a bit to suit your tastes. 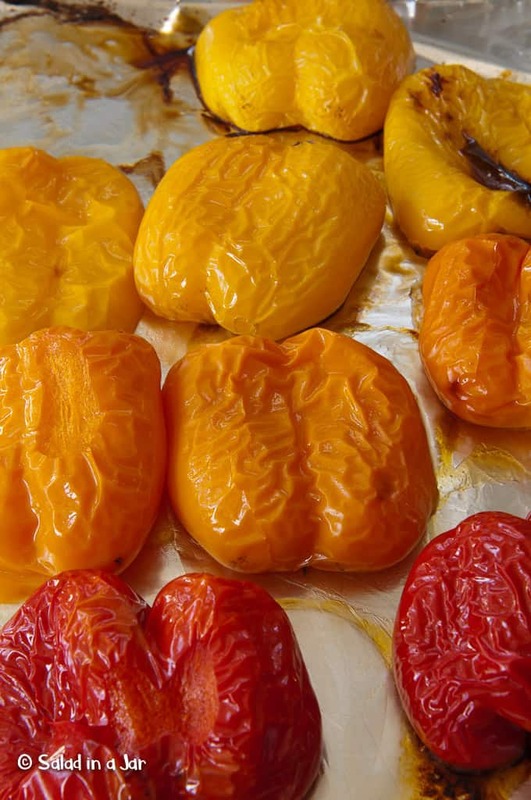 I agree with you about the sweeter red and yellow peppers. Paula, this sounds right down my alley! I have never eaten a combination of black beans and corn in a southwestern dish I did not like, and I am going to take your word that the cauliflower is camouflaged since my husband won’t eat it. I am always on the lookout for things that can be frozen ahead. I may be retired, but I still have evenings in the kitchen when I am not “into” cooking for some reason. Thanks so much for this recipe! Everything is going on my list for the grocery this week. Tell me how you heat them in the microwave please, and tell me how many watts your microwave is, approximately. Re: the microwave question. It’s a good one but I don’t have a specific answer. There are too many variables: the size of your peppers, how much filling is in them, how much power your microwave has, etc. But…a good place to start would be three minutes if the pepper is frozen. It will probably take more like 4-5 minutes to thaw and heat but you’ll know better once you do it a few times. Thanks for writing. You always ask the BEST questions. Thanks, Paula, that was a great answer. All I wanted was a place to start. Have a great weekend!